Enforcing court orders is a tough job. Each case involves multiple parties, including children, parents, guardians, lawyers, court officials, child support enforcement officers, and office staff. Most importantly, child support enforcement is a high-impact business—children’s lives are at stake. The entire system needs to work efficiently, accurately, and successfully to promote the wellbeing of the children it serves. Unfortunately, with many moving parts, the system can be inefficient. To minimize the complexity, the 18th Judicial District Court of Sedgwick County, Kansas – Office of the Court Trustee looked to the market for software to automate their processes and more efficiently enforce child support orders. However, the available off-the-shelf software was lacking the collaborative and usability features the office required. 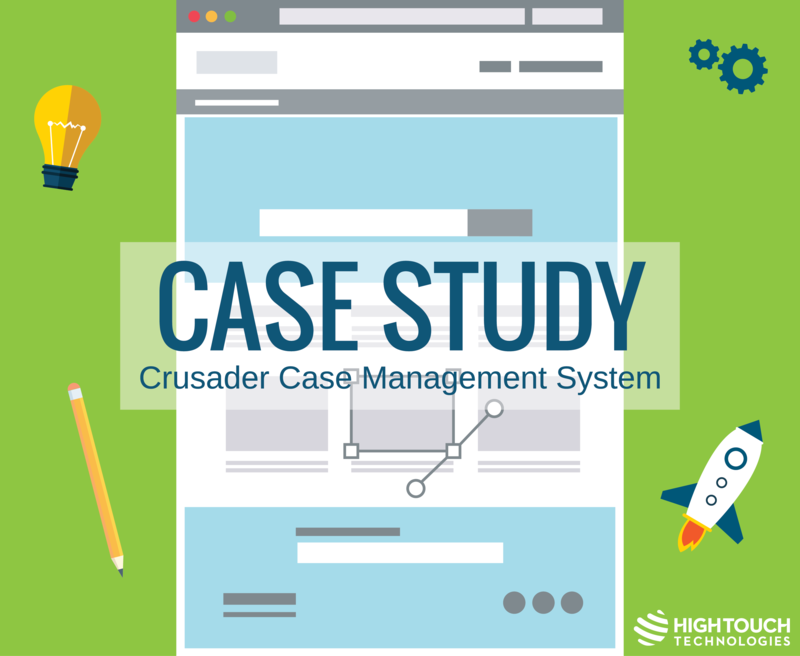 Instead of settling for the expensive, underperforming software already available, the Office of the Court Trustee contacted High Touch to develop a custom software solution. In 2018, the 18th Judicial District Court processed over 67,000 cases. In order to better enforce child support cases alongside traffic tickets, fish and game cases, and marriage licenses, the Office of the Court Trustee needed a new case management system (CMS). Off-the-shelf CMSs are built for law firms, not child support enforcement offices. The Office of the Court Trustee needed a CMS that worked for them as well as the lawyers assigned to the cases. Child support cases are difficult to track. With aging children, address changes, job changes, and income variation, there are many unique, yet essential data points the office needed to regularly track and recall. Current methods for managing cases are inefficient. Office staff needed a better way to manage tasks, calendars, and time. Arrears calculation can be difficult. The Office of the Court Trustee needed a way to integrate payments from the Kansas Payment Center and automatically calculate arrears. Child emancipation overpayments are a constant issue. As children age, there was no notification alerting the office to update child support orders or income withholding orders (IWOs). Drafting common use documents takes too long. The office regularly generated the same documents for use in court and communication. Automatically generating these documents could save time and improve consistency. High Touch would help the Office of the Court Trustee by engineering new CMS software for child support enforcement offices. Instead of focusing on lawyers and their cases, the new CMS software would help the office better enforce child support cases, therefore improving the lives of children in the community by more efficiently processing cases. High Touch built the new software on the Microsoft .NET framework for longevity. By comparing old process times with new process times, the new CMS has helped the Office of the Court Trustee save 185.71 hours per month on average, which is roughly equivalent to adding an entire full-time employee to the staff. Arrears Calculation Program · Creates a one-click solution to time consuming arrears calculations. · Integrates payment data directly from the Kansas Payment Center. · Easily identifies renewal affidavits, requests for pay off information, and movements to contempt. Time and Task Management · Plans tasks to better manage time and caseloads. · Adds staff reminders indicating full calendars. · Populates list of docket cases for any specific day, which allows attorneys to manage their time and prepare for court. Delinquent Case Management · Easily populates a list of delinquent child support cases. · Identifies accounts in need of collections. · Improves percentage of paying cases. Child Emancipation Alerts · Quickly generates new IWO upon emancipation. Document Generator · Automatically pulls data to populate pleadings and letters. · Allows staff to update forms easily. · Produces consistent documents for court and public. Information Screens · Maintains history of child support and medical orders. · Displays information about non-custodial parents, custodial parents, and children. Additional Features · Links cases related to specific employers. · Allows staff to create comments and notes on a case. · Adds ability to search for notes when unable to locate case number. Have you been considering a custom software solution for your business? Our expert software engineers can build solutions from the ground up, modify existing solutions, or take over the development of in-house legacy applications.